✔AVOID OVERWEIGHT CHARGES AND AIRPORT STRESS – Easily on spot rearrange weights between bags by switching travel cubes. Take 1 cube with you as a carry-on item to reduce weight on checked-in luggage. Airport Security checks are easier AND LESS INTRUSIVE than ever. your clothing that makes it easy to pack and even easier to unpack. DIGITAL ACCESSORIES POUCH help hold your digital devices and accessories in one place to avoid missing during your trip. TOILETRY BAG has Large Interior Volume holds all your travel toiletries, cosmetics, shaving accessories and more. LAUNDRY BAG help Separate your DIRTY CLOTHES At The End of The Trip. 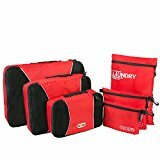 NEXTOUR(TM) Packing Organizer System is made with a high quality durable WATER RESISTANT FABRIC built to withstand the wear and tears of travel. Highest construction standards utilized and interior seams fully finished for durability .